– In compliance with art. 13, paragraph 4, of Legislative Decree no. 196/2003, as amended, in the case of relations between entities, the information through the customer / supplier of the owner will be issued to any interested parties involved in its treatment when pay business or profession or work together or are in commercial relations with these and all those whose data can still be communicated, known and / or processed by the holder in execution and carrying out of the main report. In any case, it is your responsibility to publish the information in these web pages owned to ensure full knowability of its essential elements. That said, the M.P.T. 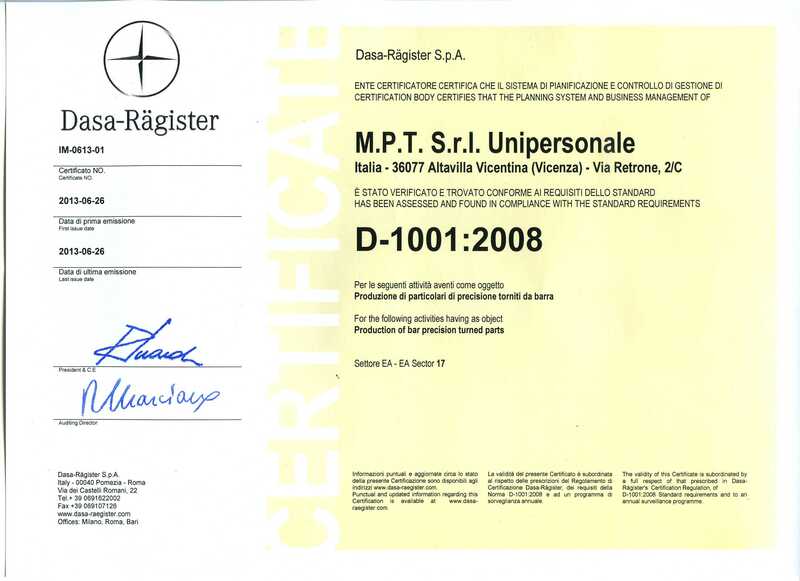 Unipersonale SRL, with registered offices at (36100) Vicenza, Via D. Meschinelli 90 and its operational headquarters in (36077) Altavilla Vicentina (VI), Via Retrone n. 2 / c Italy, in its capacity as holder of the treatment, in the person of its legal representative temporary, pursuant to the Legislative Decree of 30 June 2003. 196, hereby, inform the persons concerned on what the purposes and methods of processing of personal data collected, their scope of communication and dissemination, as well as the nature of their contribution. The personal data identifiers, administrative, accounting, tax, and any judicial, directly related to the person (if an individual) or for data mainly identifying, other interested parties (such as contractors, employees, representatives, customers, etc..) Disclosed running and conduct of relations with the Owner and in accordance with and subject to the provisions on processing and protection of personal data, are used by the owner in full respect of the principle of fairness and lawfulness and legal provisions to fulfill the purposes instrumental and functional to the performance of the pre-existing relationship and / or contract, as well as to carry out related activities, such as registration, storage, processing and billing. The data processing is carried out through computer procedures or any means electronic or printed versions of subjects, internal or external, to what the employees or committed to privacy. The data are stored in paper and electronic with full assurance of the security measures provided for by the legislature. The data collected will not be subject to disclosure and dissemination. Disclosure to third parties, other than the Holder, by management, internal as well as external to the company, and the responsible treatment identified and appointed respectively under Articles. 29 and 30 of Legislative Decree no. n. 196/2003, as amended, is provided in relation to public bodies for compliance with the law, as well as subjects and third parties, such as consultants in the field of accounting, tax and legal, company credit recovery, administration and consultancy contracts, third-party companies supply computer support and, where communications are necessary for the proper pursuit of the purposes described. In each case the use by third parties must be done correctly and in compliance with applicable laws. c) certification that the operations in letters a) and b) have been notified, as also related to their contents, to those to whom the data were communicated or disseminated, unless this requirement proves impossible or involves a manifestly disproportionate to the protected right. You have the right to object to the processing on the terms and in the manner provided by the provisions mentioned. The Owner is the M.P.T. SRL, with registered offices at (36100) Vicenza, Via D. Meschinelli 90 and its operational headquarters in (36077) Altavilla Vicentina (VI), Via Retrone n. 2 / c Italy. For any communication under articles. 7 et seq. Legislative Decree no. 196/2003, the holder provides the address info@www.mpthitech.com. The data will be kept for the time required to carry out administrative, accounting and tax related to the existing relation and also descended from the obligations imposed by law, within the time period limitation periods set out the rights and obligations underlying the treatment. The conferment of data is compulsory for the formalities required by the law and punished for the rest of the provision is optional but necessary and possible refusal by the individual makes it impossible for the owner to follow establishing relationship and the its timely execution. Pursuant to art. 24, paragraph 1, point A), B) and D). Decree 196/2003 and subsequent amendments consent to the processing of these data is not necessary as they are collected and to comply with legal requirements and / or for the performance of obligations arising from a contract that or those precontractual.